The John Adams Society is delighted to announce the appointment of JAS chairman Richard Stephenson as Officer of the Order of the British Empire (OBE) by HM The Queen in the New Year Honours, for his extensive charitable work and public service. 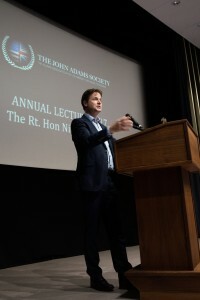 In addition to his chairmanship of JAS, Richard has supported a range of charitable and voluntary causes benefiting animal welfare, young people and medical science including chairing the Battersea Cats and Dogs Home corporate engagement board and as president of Kids Count, a charity working with young people in rural and urban areas, having previously served as its chair for a decade. 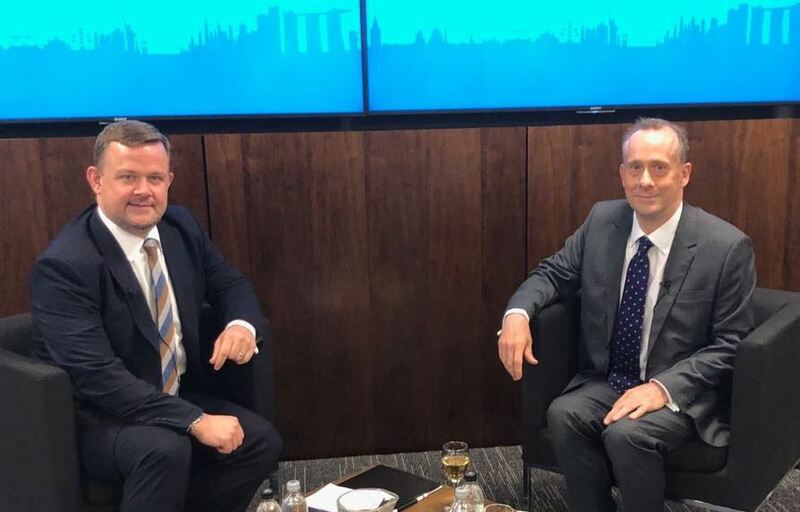 Richard’s recent efforts in his role as the Civil Aviation Administration’s (CAA) communications chief have been described as “instrumental” in the response to the biggest peacetime repatriation effort of recent times following the administration of Monarch Airlines. CAA chairman Dame Deirdre Hutton said: “Richard’s enthusiasm, dedication and energy is infectious and his history of helping charities is inspirational. During the Monarch Airlines administration, I witnessed first-hand his commitment to the CAA and his communications expertise and I am delighted that his enormous efforts have been recognised in this way”. As one of the central JAS principles, recognising the value of giving back to the community is shown by Richard's lifelong dedication to charity and public service. This has also been exemplified by fellow JAS members Taryn Khanam BEM and Nick Way OBE, who were recognised in previous New Year Honours for their outstanding contributions. Richard’s investiture will take place on the 2nd of May. On Wednesday 5 September, the John Adams Society was delighted to welcome Brexit Minister Lord Callanan for a wide ranging discussion on the current state of Brexit negotiations. 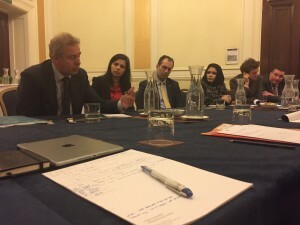 The event, kindly hosted and sponsored by Cicero Group at their City of London offices, was attended by a wide range of JAS members and friends. JAS Chairman, Richard Stephenson, interviewed Lord Callanan and invited members and guests to put their own questions to the Minister. Having previously served as a Member of the European Parliament for over 15 years, Lord Callanan was well-placed to offer his unique insight into the complexities of the negotiations. As expected, there were no shortage of questions as Lord Callanan responded to both professional and personal hopes and concerns from the Brexit negotiations. The Minister was asked about the current Brexit situation, the Chequers agreement, and a range of sector specific issues were raised. The John Adams Society is organising a number of Brexit related events in the months ahead, and we expect spaces to continue selling out quickly, so do keep an eye out for announcements. If you have any suggestions or requests for a JAS event or series, then please get in touch with the JAS team below- we always welcome input. A select group of JAS members visited the Regent’s Park Open Air Theatre last night to watch a production of the ‘Little Shop of Horrors’. It was a very colourful, energetic and high-octane performance that was much enjoyed by all those present. In August 2018, the John Adams Society was delighted to launch a new website that will assist the organisation in all aspects of its administration, event planning and membership communication. The new website was built using the 'Wild Apricot' platform. We would welcome members thoughts and comments on this new website. This morning, JAS hosted one of its 'breakfast briefing' sessions with the Rt Hon Nicky Morgan MP. Kindly hosted by Newgate Communications, Nicky spoke to about 50 JAS members and guests and covered a wide range of issues. We are now planning more in our Brexit series. 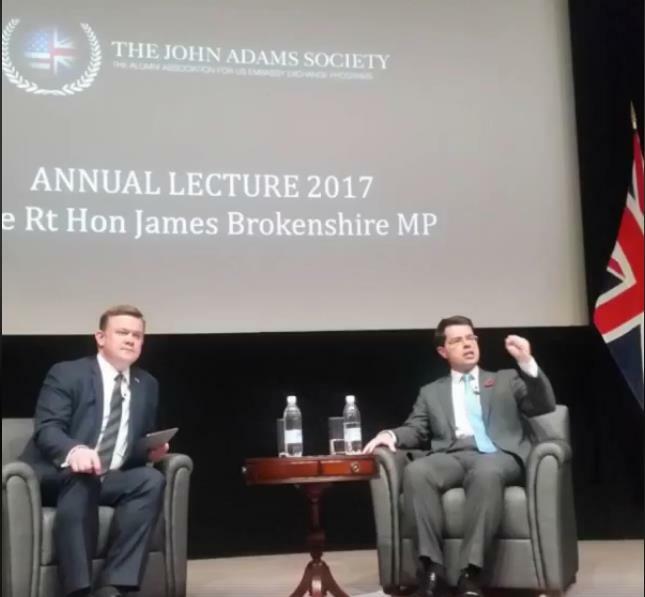 The John Adams Society was delighted to welcome Cabinet Minister, James Brokenshire MP, to deliver the 2017 Annual Lecture on the 2nd of November. 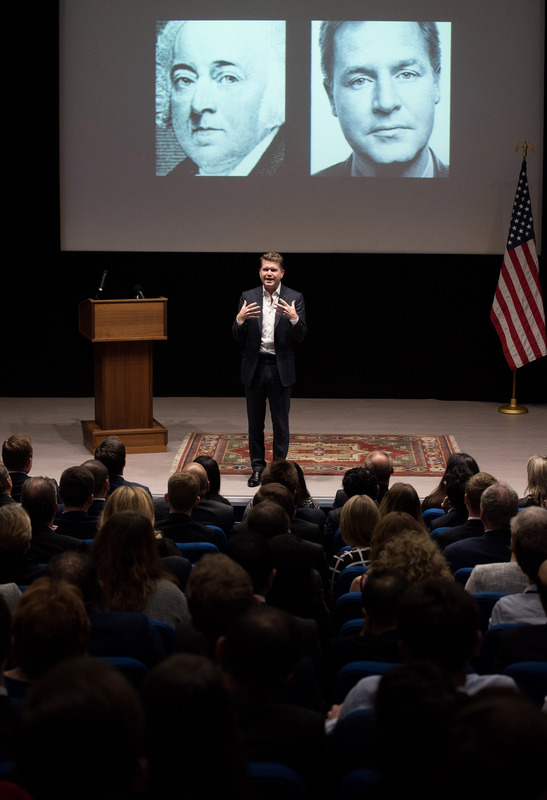 Mr Brokenshire, currently Secretary of State for Northern Ireland, addressed about 150 JAS members in the auditorium of the Embassy of United States in Grosvenor Square - one of the very last events to be held at the Embassy before the Mission moves to Battersea in early 2018. The Minister spoke about his role in Northern Ireland and his passion for his work. 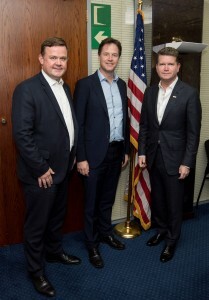 He spoke about the deep links between Northern Ireland and the United States and welcomed the opportunity to speak to JAS and promote the special relationship which is just as relevant today as it ever has been. Following the lecture, Mr Brokenshire took questions from members on a wide range of diverse topics including the future of the NI government, Brexit and equality. A drinks reception was held after the event where members continued to network and enjoy the evening. The JAS Annual Lecture took place on Tuesday 15 November 2016 at the US Embassy. Former Deputy Prime Minister, Nick Clegg MP, delivered a passionate and inspiring address to a full-house in the Embassy auditorium. I am delighted to support the John Adams Society. I have had the privilege of speaking to the Society twice, and meeting many of its members. So I have seen at first-hand their passion, energy and enthusiasm for the Special Relationship.They radiate ideas and committment; we are lucky to have them; and I am proud to consider myself a friend of the Society. In my position as British Ambassador to the United States, I see every day the value of bodies like the Society. Both of our nations need the free thinkers, the cultural exchanges, the better understanding of each others’ histories and the challenges we face. The John Adams Society exemplifies the historic alliance between the UK and the US, and the ties that bind us. In this turbulent world its work and values are more important now than ever. JAS Member Nick Way received an OBE in the Queen’s Birthday Honours List, for services to the conservation of the UK’s Architectural Heritage. Join Fulbright alumni, U.S. government-exchange alumni and European Network of American Alumni Associations members at the hotel de Talleyrand in Paris to discuss the impact of climate change on water resources. Expert panels will explore the mechanisms of mitigation and adaptation necessary to limit the impact of climate change on the well-being and livelihood of societies. Early registration before July 15th 2015 is strongly encouraged, but France Fulbright Alumni will accept registration until September 30th. Attendance is free. Register by sending an email to wateract.symposium@gmail.com with the information requested in the attached document (personal information, exchange program and alumni association details, contact information and motivation). Please note that participants are expected to organise and cover their own travel, lodging and visa expenses.